Corsets are measured in inches, and the sizes shown (e.g. 28, 30) are what the corset measures in inches around the waist when the back is fully closed and no skin or modesty panel can be seen below. Because corsets are designed to reduce the waist, you will want to purchase a corset that is smaller in the waist than you are. Start by measuring around your natural waist (the smallest section of your torso, directly under the ribs where you are naturally your thinnest). If you are buying your first corset, your body will not be used to being squeezed into a body-modifying garment, it is therefore sensible not to try and squeeze too much in. What your body can handle will depend heavily on what we call your 'squish factor' - how easily you can squeeze your waist smaller. As a first-time corset buyer, you may find it easier to judge how squishable you are using the tape measure. Standing straight, place the tape measure around your natural waist and then gently tighten it, squeezing the measurement smaller. You may find that you can 'disappear' the inches easily, whereas for others it can be harder. As a general rule, your first waist-reducing corset should be between 4 and 6 inches smaller than your own waist and the easier you are to squeeze, the easier your waist will reduce in size. Example: Say you have a waist size of 28 inches. If you could easily reduce your waist by 4 inches or more with a tape measure, it would be sensible to choose a corset that is more than 4 inches smaller than your own waist as you are likely to be able to reduce your waist quickly with practice. You should therefore go for a 22-inch corset. If it was difficult, or you reduced by less than 4 inches in total, you should buy a 24-inch corset as your body may take longer to adjust to wearing a waist-reducing garment and the 4-inch difference may be a challenge. One of the biggest mistakes people make when trying on a corset for the first time is trying to do it all yourself. If you are not used to lacing yourself into things, you're likely to get into a tangle mess and could even warp the corset. If you have never worn a corset before, watch the video carefully to ensure you know what you're doing before you start. When buying a corset these terms will be used a lot so get familiar with them and you'll end up with a corset you love. Busk: The fastening on the front of a corset with what look like big hook and eye fastenings. It is usually made of metal and in good quality corsets, will stay firmly closed and reveal no flesh underneath. Steel Boning: Thin strips of metal that are sewn into vertical pockets in the corset. Steel boning shapes the body and is responsible for the waist-reducing effect you get from wearing a corset. 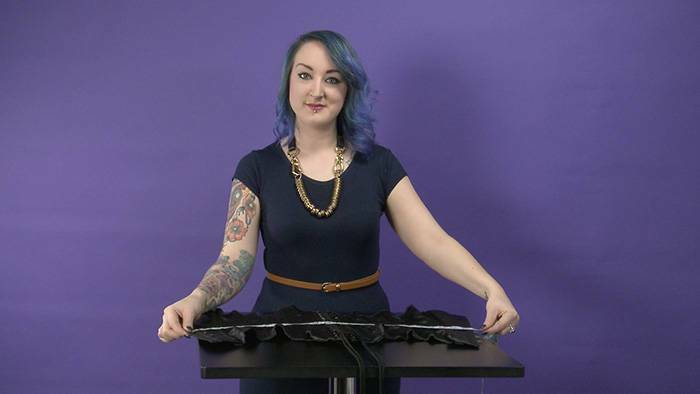 Plastic Boning: Strips of plastic that are sewn into vertical pockets in basques, bustiers, most corset dresses and some suspender belts and cinchers. It can twist, bend and flex more than steel corset boning and won't create an hourglass figure, but provides a firm shape to the garment so it looks the same on you as it does when it's on a hanger. Modesty Panel: A piece of material that is sewn into the inside of the corset near the lace-up back section. A modesty panel lies flat against the body and stops skin from showing but can be folded over if you want to flaunt some flesh! Eyelets: The metal rings through which lacing is threaded. You can Contact Customer Care, who will be able to help you find the perfect corset - try to have a tape measure to hand so you can give the advisor your measurements. You can send an email any time, and telephone or live chat to an experienced advisor 24 hours a day, 7 days a week.